Saturday afternoon, after getting my orange hair cut off (another story), I headed to Vandolah Nature Preserve, which is perhaps 2 miles from my home. My friend Tammy and my friend and husband Steve met me there. After we had a picnic on the entry bench, we headed into the preserve. There are a lot of very old apple trees at the entry, remnants of a farmstead. Ellsworth Smith told me that the woman who donated the land recalls her grandmother telling how Johnny Appleseed would eat dinner at their farm but would then leave to sleep outdoors. Are these descendants of trees planted by Johnny? After leaving the orchard area, we hiked along a trail that borders I-69. At this point, you wonder if you really are in a nature preserve, with the numerous trees downed by the utility company, the cars and trucks whizzing by and the bush honeysuckle thicket. Then you head into the ravines. We had quite a discussion whether this wetland was a fen, swamp or marsh. The cut-leaved toothwort is ready to bloom. And the hepatica is in full bloom. Once we spotted this bloom, we discovered the whole south-facing hill was abloom in hepatica. Looking down the hill, we spotted this hollow stump, with the perfect peephole over the wetlands. And a perfect place to get out of the wind. Oh, no! Someone has lost the trail. If only that person can make it to the solid log off that rotten log. Will we have to undertake a rescue? A picture of perfect grace. After prancing down the ravine, we slowly climb up, taking rests as needed. Perhaps we will see you at the next preserve we hike. I visited my fourth ACRES Nature Preserve yesterday. Before hiking a few trails, I attended a talk by Don Gorney about the 18 warblers that nest in NE Indiana. Don moved to Indy and is devoted to Lights Out Indy, a movement to turn out the lights on tall buildings which confuse many birds, including migrating warblers. These birds crash into the buildings and die. He estimates that more oven birds were killed by running into buildings in Indianapolis than were hatched. As a very amateur birdwatcher, I decided to focus on finding a Yellow-throated Warbler because it nests in riparian woods with open canopy, primarily sycamore trees. We spend a lot of time in this habitat on the river. It should reach this area in mid-April. I'm also keeping an eye and ear out for the prothonotary warbler because it is such a beautiful bird. Despite the recent warm weather, it is still early spring and trees are identified by bark and other characteristics. The beech tree is easy to spot because of its smooth grey bark and the fact it holds its leaves all winter. We saw a nice example of shelf fungus. the first wildflower in bloom, Harbinger of Spring. In my quest to visit 50 ACRES preserves, last evening Steve and I stopped by Foxfire Woods on the way to the Highlands (our tree farm) and we ignored the random capitalization on this sign! It is a small preserve, just 7.9 acres, acquired in 1974. We hiked a half mile back to the preserve and then the half mile loop through an open forest. There was not much green yet, but I did find a Christmas fern. We were entertained by the songs of birds and a very noisy chorus of spring peepers in the vernal pool at the back of the preserve. Foxfire is a bioluminescent fungus that is best seen in late summer and early fall, but I did see several other fungi. We saw an interesting burl on a tree. And when I looked at the other side of the tree, this happy wood gnome was staring back at me. It was a pleasant way to start our evening, which ended by enjoying a pizza and wine by a campfire at the tree farm. Such a busy weekend and I wondered how to fit in another ACRES visit. Then I realized that the McNabb-Walters Nature Preserve is almost across the road from our tree farm and we had to drop a load of wood off at the farm anyway. When our friends Tammy and Brian called, I asked if they wanted to meet us at the preserve for a quick hike. 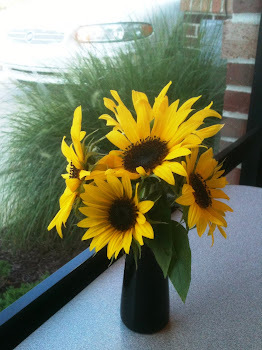 We met at the entrance at 5:00 on Sunday March 7, 2010. The picture above is the Davis-Fisher Creek which drains into the St. Joseph River. It cuts quite a deep ravine through the land and is pretty even without any leaves. We hiked with Tammy and Brian late last fall along the river ravines, admiring the same stark beauty. This is a locust tree with thorns over a foot long. Some trees are easy to identify in winter! These shrubs are native spice bushes (Lindera benzoin) and are hosts to the spicebush butterfly. Their buds are round little balls. If you chew on a twig it tastes like spices - cloves, ginger, nutmeg? Tea can be made from the twigs and seeds. The trail loops around the remnants of an old sugar shack, as the woods are filled with sugar maples. We found scars on the trees where they were tapped many years ago. but we did find an old sleigh used to haul sap to the sugar camp for boiling down. The sleigh was in remarkable condition, but buried by so much debris it was hard to get a picture. Hey, ACRES, this sleigh might be worth salvaging. It was in pretty good condition. And rue was starting to grow. I looked for, but did not find, harbinger of spring. It is probably too early. And I love fungus. These little buttons had seen better days, though. Steve and I plan to stop by the preserve more often, coming and going from the tree farm, watching it as it bursts forth with ephemeral spring flowers. We feel a special kinship to it as we made friends with Alwilda McNabb Walters when she was in the nursing home. She told of how her husband's family acquired a lot of the land. They owned a funeral home and if someone could not pay for the funeral, he would accept payment in land. 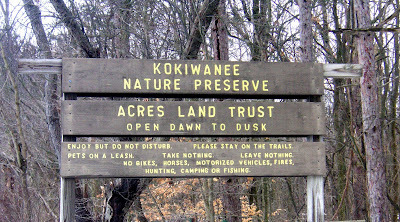 At the beginning of 2010, I had only visited 5 nature preserves out of the 68 preserves owned by ACRES Land Trust. So I decided to make a concerted effort to visit more preserves, specifically to visit 50 preserves this year, to commemorate ACRES’ 50th anniversary. It was an overcast day but we had high hopes as my husband and I followed our friends Renee and John to the Salamonie Dam, where they had seen bald eagles the previous Sunday. On the drive, I suggested to Steve that we start visiting ACRES Nature Preserves. At the dam, we did not see any eagles, but several fishermen said they saw some at Kokiwanee several days prior. So we hopped in the cars and I started my quest to discover 50 preserves. It was a gray day, but we happily hiked down Mossy Heights Trail to a limestone ledge overlooking Salamonie River. Steve and John arrived first and were getting their binoculars out, while Renee and I followed with her entertaining me with her memories of going to Girl Scout Camp at the site. As we approached the ledge, suddenly she said, “There’s an eagle!” It was perched in a tree directly across the river, giving us a full view. I was startled by its size and how white its head was. In a few seconds, the eagle flew upriver and we settled in for some serious bird watching. Except where were they? So we inspected the moss on Mossy Heights. Soon an eagle flew down river. It’s the little black dot in this picture. I don’t have the equipment to capture an eagle flying, although this was the first time I tried it. A few minutes later, an eagle flew right in front of us. I was too slow to take a picture, but, to tell the truth, my mouth was probably gaping open at the sight. 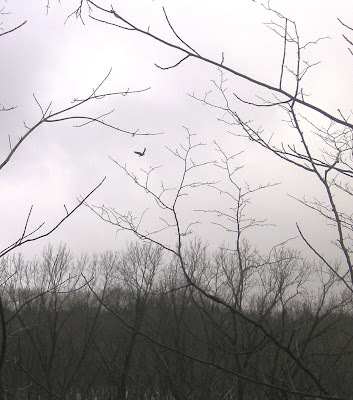 While it was too icy to tackle the trails, spotting bald eagles was quite a start to my 50 in 50 adventure. I wonder what the next preserve will bring?